Among the issues Apprising Ministries has been tracking for you the past couple of years, during what may one day be known as the New Downgrade No-Controversy, is how even the heretical Word Faith movement continues to head toward acceptance within the mainstream of evangelicalism. Take for example, Word Faith Heretic Cindy Trimm Receives Award From Billy Graham Evangelistic Association. Recently in T.D. Jakes Repents Of Word Faith Heresy And Mythology I reminded you that Elephant Room 2 co-hosts James MacDonald and Mark Driscoll used ER2 to mainstream Word Faith mogul T.D. Jakes. ER2 would be the catalyst for what seems to me to be a new self-appointed Evangelical Ecumenical Magisterium (EEM) of multi-site megachurch pastors. One of those in the EEM who’s star is quickly rising is prophet-pastor Steven Furtick of Elevation Church (EC) who’s told us: T.D. Jakes Is My Favorite Preacher In The World. Secondly, the prophet-pastor megachurch model uses occultic “vision-casting”; this is due to the influence upon them of Leadership Network, who sees to it that the chosen have a book deal. It all begins as the dutiful prophet-pastor first ardently studies the holy writings of the like-minded prophet-pastors who have gone on before him. Then, filled with his lofty dreams of megachurch church-planting stardom, the prophet-pastor starts meditating upon his hero’s works until finally the delusion arrives. Now the aspiring prophet-pastor has received his extra-biblical “vision,” allegedly from God, as to how it is he’s going to help make “God’s dream” come true. After that the prophet-pastor goes about selecting his hand-chosen yes men disciples and they accompany him before his followers congregation where prophet-pastor lays down the law casts said vision before this flock. Then it’s up to the “church” to do whatever it takes to make prophet-pastor’s delusions of grandeur come to pass. Turning specifically to Furtick now, in Steven Furtick Bringin’ On Word Faith And The Pastrixes I introduced you to Furtick’s aggressive hybrid mythology I call Furtickism. Furtickism is a unique, carefully crafted, combination of Seeker Driven evangelicalism mixed with the softer self-help-style Word Faith prosperity of Joel Osteen. 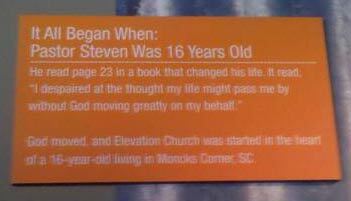 Every weekend, about 14,000 worshipers attend Elevation Church’s nine locations in and around Charlotte. These Elevators, as they sometimes refer to themselves, give a total of about $400,000 a week to what has become one of America’s fastest-growing churches – in attendance and donations. Elevation does have a five-person governing board. But it offers none of these seats to those who actually fill up the church’s theater-like sanctuaries every Saturday and Sunday. Instead, Furtick and four out-of-town megachurch pastors direct the church’s $25 million budget, its ambitious building program, its debt and a host of other matters. But these participants – Elevation prefers that word to “members” – have little say in how the megachurch is run or in how it spends its millions. 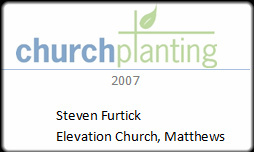 And except for the church’s chief financial officer and its controller, no one who’s made Elevation their spiritual home has any idea how much money Pastor Steven Furtick makes. “They’d be the only church connected to our association that would have that kind of model,” said Bob Lowman, executive director of the Metrolina Baptist Association in Charlotte. It’s also “not the most typical way megachurches organize,” said Scott Thumma, one of the country’s leading experts on megachurches. questions have been raised about whether the board has the independence to provide strong oversight and hold Furtick and his staff accountable. “I just don’t know how (a board of out-of-town pastors) can understand what’s going on in the church if they’re not there,” said Simeon May, CEO of the National Association of Church Business Administrators, whose member churches tend to belong to denominations. 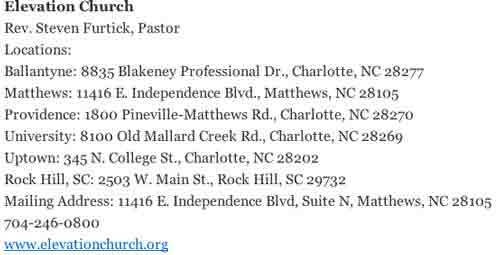 Other questions about Furtick’s compensation have come to the fore in recent months after reports by the Observer and WCNC-TV that he was building a 16,000-square-foot gated estate on a large wooded lot in the Weddington area of Union County. The news about Furtick’s luxury home and the way he bought the land – listing a trust, not his name, on the deed and tax records – has for some drawn comparisons to the PTL saga. Once a Charlotte area success story, Jim and Tammy Bakker’s TV ministry turned into a national cautionary tale about what can happen when there’s too-little transparency and oversight.